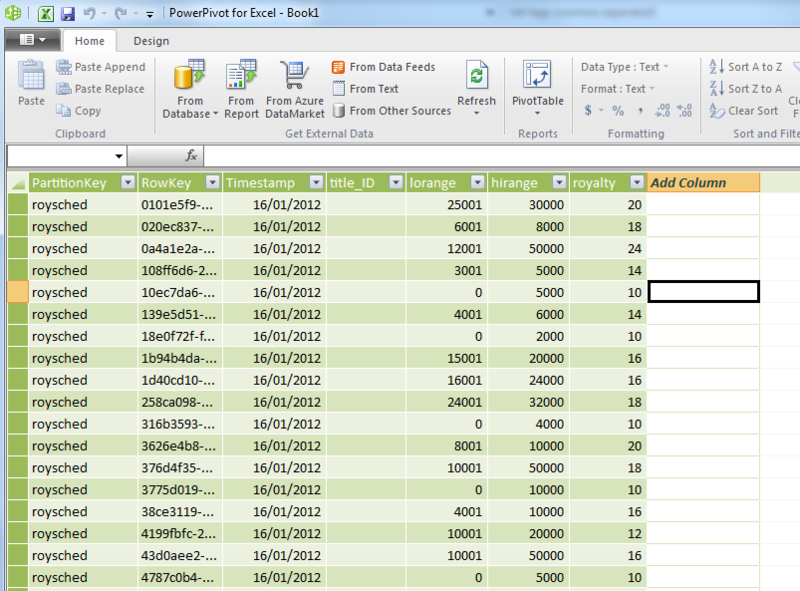 A customer asked yesterday a very good question – is it possible to use PowerPivot analyse data stored in Windows Azure Table Storage. Given that Table Storage is exposed through oData, which is, as you’d expect, a data source fully supported by PowerPivot, my gut feeling was that this should not be a problem and, in fact, a very interesting scenario – many customers use Windows Azure Storage to store vast quantities of data, given how cost-effective it is and the scale that is possible, but ultimately data is there to be used, and PowerPivot is an amazing tool to process data – the two together make a powerful pair. Looking at it closer, though, I stumbled into a small hurdle – whilst PowerPivot had support for working with data from Azure DataMarket out of the box for some time now and it supports working with oData feeds, I don’t believe it supports, currently, working with Azure Table Storage directly, the stumbling block being the ShareKey authentication mechanism. However, this is too useful to give up, so I looked at a workaround, and the most obvious one was to take the man-in-the-middle approach and to publish a WCF Data Service onto an Azure Web Role (doesn’t have to be, of course, but makes perfect sense), which would expose a ‘standard’ oData feed to be consumed by PowerPivot and would get the data from the Table Storage. simples. To do that I needed some data in Azure Tables and so I decided to use Cerebrata’s Cloud Storage Studio to upload the pubs database to Window Azure Storage – quite a cool and useful feature of their product if you ask me! With that done I needed to create a context class to be used by the WCF Data Service, this class will read data from Azure and ‘re-publish’ data as the feed behind the data, this is where the majority of the logic would generally go, but as you can expect I’ve kept this to the minimum for the purpose of this demonstration. Also bear in mind, as these samples often go, this is by no means the best or most efficient way of doing things, but I did want to keep things as simple as possible to focus on the concept rather than lines of code – in a real, production, code I would almost certainly not want to create the Azure TableServiceContext on every call! I needed to define the DataConnectionString configuration setting in the csdef file and add the connection string value pointing at my Azure Storage (or the local emulator), this is easily done through the Visual Studio UI. // configuration settings change in the service configuration file. My AzurePubsContext class did not have any public properties that do not return IQueryable, so this was not pointing directly at the problem, but it was clear that I have an issue with the entity I was using. I was trying to represent pub’s roysched table, migrated to Azure Table Storage and I suspect my problem was that there was no obvious key the Entity Framework could use. Specifying the [DataServiceKey(“PartitionKey”,”RowKey”)] attribute on my entity class sorted this quickly enough. The latest ‘cloud computing’ newsletter pointed at Alistair Croll’s Top 12 Cloud Trends Of 2012 which makes an interesting read; particularly interesting, I found, was his ‘Trend No 8: An SLA Detente’ (I had to look Datente up, turns out it means relaxation…). In his article Alistair suggests, and I paraphrase, that customers’ expectations from the SLAs provided by cloud vendors are unrealistic and he suggest the point that Car makers don’t provide insurance as part of the deal to purchase the car, but rather customers buy insurances they deem necessary separately. This had got me thinking – the man does have a point. to a point. I would suggest that analogy stretches further, and actually taking about the warranty is a better viewpoint – Consider you’re a logistics business in need of a fleet – you would make your research and settle on a car from a maker with a good track record of reliability and service. You might pay premium for these, but you asses the risk and suggest that buying a truck from a reliable manufacturer is worth more than buying one from a less robust maker; I don’t think anybody believes it is possible to buy a truck which ‘5 nines availability, and even businesses that relay on these accept a certain amount of ‘down time’; of course we expect a good maker to have a good service network, that will see our truck fixed in the shortest amount of time possible (and at the first attempt), and we would almost certainly expect a courtesy car/van/truck whilst ours is in the garage, but if it takes half a day to sort this out, in the main, we accept the fact.